My previous Thai talk post on dating and Thai love phrases proved pretty popular, so I thought I would create a useful set of “Thai for beginners” phrases that will be useful for travelers and those just starting to learn. As always, I've written the phonetic English translation, and given you the Thai script. The entire lesson is also in video format at the bottom of the page. 12. Where is the rest room? 13. How much does this cost? 14. Can you give me a discount please? You can leave out the “khor hai khun” and just say “chock dee khrup/ka” if you like. 24. Do you like football? 25. Which team do you support? * Please note that the phonetic translations don't have the tone marks required for a completely accurate pronunciation. However, if once you start using the phrases out and about, Thai people will happily help you with the correct tones. Practice makes perfect, and the only way to get better is to converse with native speakers. 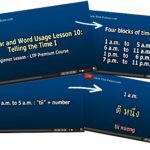 If you want to learn Thai at home or enhance your school lessons, I highly recommend the Thaipod101 online course. I am currently combining this online course with my school learning and it's working well for me. I find it gives me a lift between classes and doesn't allow me to solely rely on the two lessons a week. It also gives me some diversity away from the generic learning structure of the school syllabus. The video files for the learning program are iPod/iPad and Android compatible, which is cool because I can learn on the go while in cafes and on the train. You can register a free basic account here and start learning now. Anyway, it's time to move onto lesson 2 – to further expand your vocabulary! I recently started to date a Thai lady(she is 53) here in the USA and she is frequently asking me for money so she can pay bills($3300) for her mother(she is 88) and for her daughter(she is 24) and who live in Thailand. She tells me it is Thai custom for adult children to pay back to parents for their kindness for bringing them into this world. She also asked me for money to help pay for land she purchased($13,000) in Thailand and to pay off her pawn shop bill($2700) for jewelry she pawned a few years ago. She always insists I give her cash. I like to help people in need but it is now up to $19,000 and I think this is a bit much at this point. Am I being scammed or is this a Thai custom....which she says it is? I feel I am being taken advantage of but I want to know if this is normal Thai behavior. Thank you for any advise and guidance you can give me. Gambling and drinking money for the whole extended family. Cant believe Thai women in the USA also pulling the same tricks. I come to Thailand quite often and have a great friend here, If I asked her what her thoughts are on your lady friend She would tell you to "be careful".But I am sure your eyes are wide open.Anyway good luck and I hope you dont get turned over. I’ve lived in Thailand for over 15 years. This is definitely a scam! She’s taking advantage of your good nature. Some women only see one thing in a Farang “ ATM” machine. Get rid of her, and tell her to support her own family. hi im trying to learn thai to speak with a new person at my school and i was wondering what the dashes in the phrases mean? are they alternate pronunciations of the phrase, breaks in the sentence, what? Hi Chloe, the dash here is just used to separate the Khrup/Ka from the main word or phrase. Khrup and ka being the polite male and female forms used to end a sentence. I really appreciate this website. It really helps me and anyone who wants to learn Thai. It included details about Thai life, insist useful words, phrases, sentences, and the most important thing is the Videos. Thanks. It definitely helps to develop a daily learning plan. Two of my personal tips are:1.Learn one word or phrase a day. Do not overload yourself to start with. In time you will be able to manage more learning in one day, but start with one. Just keep saying it over and over again, until you have mastered it. 1 word a day is 365 words a year. By 1-2 months you will be learning 2-3 words a day, easily.2. When learning to write Thai, get a small notepad that fits in your pocket. Draw the letter or vowel of the day on the note pad. Then close your eyes and keep drawing it over and over in your head. You can do this in the gym, on the train, at work, wherever. If you forget the shape, look back at the notepad. This is one technique that helped me learn the alphabet. Hi Johon,TTL is right. It really helps to do just a little each day but EVERY day. Learning the alphabet is a great help in learning correct pronunciation. Also, have several different sources for learning. I use mem rise.com - a game-like website that allows you to focus on a single task for however long it takes you to master it (I use this for the alphabet), I also have a handy reference book (Thai for Beginners from Paiboon Publishing) to look things up when I have a specific question, and also have a more formal lesson system (a Skype teacher, ThaiPod101, or Learn-Thai-Podcast).TTL's notebook idea is good too. Once you start learning the letters you'll find that there really are patterns and then it becomes much easier to learn. Most of all stay with it, you'll reach a tipping point and it'll all start making sense. Hi, everyone I am Thai man. I want to improve my english language too , let's exchange. I can teach you Thai language and be your friend. Hi i want to learn thai too maybe we Can talk more on social media please. I Can teach u English too you can email me Thanks! My girlfriend is thai, but I don't speak thai, I read this article out loud and she said I pronounced everything right. The good bye one is for if you have no idea when you will see them again. If said to your girlfriend it is like your breaking up with them. Good to know, hahaha (or as my gf says 555) This was brilliantly written. Khop khun khrup! Haha, that's right. It's a long-tern goodbye :) Glad your GF understood you! Ha ha ha, or haha, as in laughing. The word ha means 5 in Thai. Hahaha that's funny huh, I like it and thanks for the info. Well let's see how far can I go here! Hey bud. Great post but thought you should know 2 & 3 are wrong. You wrote สวัสดี for the first 3 instead of สบายดี for 2 & 3 as your English correctly says. Good spot Darron. I have corrected those, thanks! i learned to read and write Thai before i could really speak and golly gosh it made everything so much easier to understand... the learning process was mind torture but once i understood its just memorizing the words now! just think how you learned English in school, you start off with the alphabet. Is it a duty to say ka or kup at the end of every phrase? Hi Ozzie, not so much a duty but a polite way to speak. You will find that the majority of people interact using these niceties, though close friends will often talk and leave these out. I'm struggling with the pronounciation guide here. For example 'kao' is really pronounced 'cow'. As an English speaker when I see kao I would read this as ka-o (a double vowel sound) which is nothing like cow. I get my Thai wife to pronounce the word in Thai otherwise I'm right off track. Yes, some of the transliterations are hard to grasp which is why I provide the video lesson too. I try to stick to the accepted standard when writing the words in English, but occasionally it can be hard to work out for the reader because there are different tones and similar sounding words involved. In this case, this is "mai kao (high tone) jai", as in "I don't understand", as opposed to "gin (pronounced as a ger not a jer like the drink) khao (high tone also but different word - means rice) ruu yang?" Have you eaten yet. It is a different "khao" and therefore the transliteration spelling differs for that reason. The word that sounds like 'cow' is the word for the colour white (pronounced 'cowww'. Confusing because they all sound similar but have differentiate in Thai spelling and tone. It's not easy :)It is always best when reading a transliteration to then go and practice and adjust the correct tones with a Thai speaker or by using the videos provided. I'm not sure if you should be trying to teach people Thai when you teaching things that are incorrect. Both the kao in kao jai and khao for rice are said with a falling tone. The kao in kao jai by itself translates to the word 'enter' in English.Check it up. I am correct. Hi Ajit, hold tight, my friend, I'll be doing some Alphabet lessons in the near future. Yes, there's plenty more examples like that to come :) A friend of mine bought me some flash cards which are pretty cool. Not sure where he got them from but you could make them yourself.It 's just like a pack of card but each has a consonant or vowel on it, with the symbol, tone, class and phonetic translation. 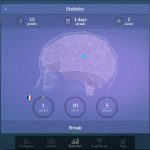 Great for learning on the go through memorisation and visualisation.All the best! Hi, an excellent site! Have you any advice where to start learning Thai script. I have a friend who speaks good English but only reads script (except perhaps numbers). So when I text her its a long job using Google and back-checking - and still riddled with poor translations. Always defaults to ka, not krup for example. Script looks horrendous to learn. Hi Trevor, it's no easy task, but here's a good place to start: http://www.thaialphabet.netI hope to be doing some script lessons on here soon, so watch this space :) All the best with your learning! Thanks. That looks like a good site, with some good learning tips. Look forward to seeing your own contribution. Not easy is an understatement- first thing I noticed was 6 versions of "k", 4 with a low tone and two high. Fun times ahead! Hi, I am little confused with khrup/ka.I have two things in mind and let me know which is correct? 1 . When you're a guy, address people with khrup (or ka if otherwise)? 2. Use khrup when you're talking to a gentleman or ka when you're speaking to a lady? Hi Ian. As a man, always address everyone with "khrup". Whether you are talking to a man or a woman, use "khrup".You will rarely hear a man use "ka", as this is the polite feminine form. The exceptions, however, are gay men, and occasionally guys will reply to their girlfriends using "ka" when playing around or being sweet. This isn't common though, and as a foreigner stick solely with "khrup" for everything.You may also hear women use "ja". This is usually used between friends and people who know each other, and by older women when speaking with younger women. You also hear this up county a lot. "Ja" can also be used by men, but until your level of Thai is good enough to know the situations when "Ja" is appropriate, don't worry about this term. Cool...Seems clear to me now. Khop khun khrup. :)Those commonly used statements/expressions will help me a lot during our visit to Bangkok. Hi Elly,I will try to simplify this as much as possible for you.You can say, "Cor Mai sai pik, mai sai pak chi, ka, khop khun ka." Or you could say, "Mai ow pik, mai ow pak chi, kop khun ka." (Literally I don't want chili, I don't want coriander, thank you".A few notes that might help:Mai in this instance sounds like "may" Ow sounds like "oww" i hurt my foot Pik sounds like "pick" Pak sound like "pack"To say I don't like chilli and coriander, you can say "Mai chop gin pik, mai chop gin pak chi"As you may have guessed, "mai" means no and chop means "like".Add "ka" to be polite at the end of everything. This is the female form.Hope this helps. I am looking for a good Thai language school in Bangkok. I have plans to leave in November 2012. And would like to stay with a ED Visa a year at a time. Any suggestions of a good school that is not a scam? A good school will help with the ministry of Education to get the ED Visa in order. But I believe you have to pay for tuition first before application goes to MED. "Ministry of Education". Keith,Thanks for your message. Sorry for the late reply I am away for Songkran. In terms of a great language learning school in Bangkok you should try Language Express. They do an affordable ED visa for about 20,000 I believe. I studied there last year and really enjoyed it. You can read more about my experience of the school here: https://thethailandlife.com/learning-thai-in-bangkokThey are a reputable outfit and all is above board.I am currently using Thaipod101 to improve my Thai from home. I really love the program and it's pretty cheap too. I wrote about this software here: https://thethailandlife.com/thaipod101-reviewI wish you all the best in your move to Thailand and hope you continue to enjoy the blog. Hi Savanit, I hope to be posting more Thai lessons up soon so make sure you check back or sign up for updates in the box on the right hand side of the page. Were you asking me what "it's nice" is in Thai? I didn't quite get that bit of your message. I'm really don't know way how to spell consonants ? and i want to know thai in fluent but i don't know only one consonant . I think all beginning speakers should know that the two languages do not always translate in a word for word fashion and dictionaries are often wrong - it's good to see you using phrases as that cuts down on the inevitable errors of tone and makes you easier to understand. It can be frustrating at times but ultimately very rewarding as Thai people can be very funny and love to joke - for me, it will surely be a lifetime experience as I never stop learning and hopefully improving.one example of above - We "put on" clothing - we "put on" cream. Thai "sai seua pah" and "tah cream" - they use a different word entirely for the different usage. I am entirely street learned but I imagine there is nothing better than a good teacher.